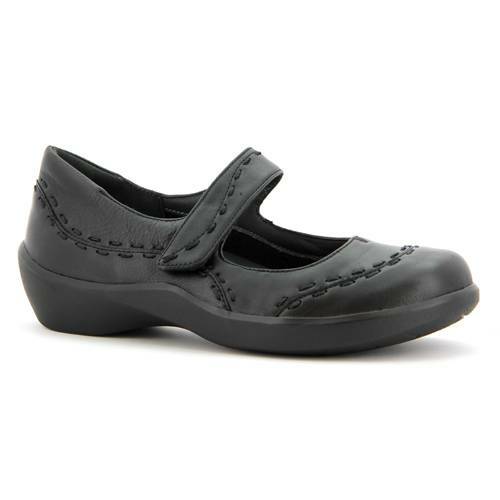 The Ziera Gummibear is a comfort mary jane ideal for those looking to be both comfortable and stylish. The Gummibear has detailed stitching, contrasting colors, and a hook-and-loop fastener for an adjustable fit. This shoe has a full length removable orthotic footbed with a metatarsal support for all day comfort. The thick polyurethane outsole serves as a great shock absorber. The Gummibear is stylish option while relieving the aches from plantar fasciitis and heel spurs. Ziera understands the role foot comfort plays in quality of life and that style plays in making women feel nurtured, beautiful and empowered. The idea of inner beauty reflected their outer beauty is what resonates with the spirit of Ziera. They believe in form balanced with function and style with science to achieve the perfect fit. The phrase “beautiful inside, beautiful outside” has become integral to the DNA of Ziera. “Beautiful inside” is how their shoes feel and the blissful walking-on-air feeling when you wear their shoes. “Beautiful outside” is about style and being inspired by fashion.